A blood stripe is a scarlet stripe worn down the outside leg seams of trousers on the dress uniform of the United States Marine Corps. This red stripe is 2 inches (5.1 cm) for general officers, 1.5 inches (3.8 cm) for other officers, and 1.12 inches (2.8 cm) for enlisted Staff Noncommissioned Officers and Noncommissioned Officers. Modified versions are worn on the officers' evening dress uniforms, with the scarlet flanked with gold trim, and on members of the Marine Band, which wear the traditional red stripe with a white stripe in the center. While trouser stripes were in use in various militaries for many years (especially the British Army, whose uniforms influenced American uniforms for many years, as well as the red stripes of the Spanish Navy Marines), red trouser stripes were not a predominant feature of any American Marine uniform until 1837. In that year, President Andrew Jackson ordered changes that included the adoption of the Army's practice of wearing stripes the same color as uniform jacket facings. These original stripes were buff white to match changes to the uniform jacket, but when the jacket was changed back to dark blue with red trim in 1839, the stripes remained, but altered to a similar blue edged in red. Tradition holds that in the Battle of Chapultepec in September 1847, Marine officers and NCOs sustained an unusually high casualty rate during the battle. In 1849, uniform regulations dictated that the stripes be changed to a solid red. Ten years later, a scarlet cord was inserted into the outer seams for noncommissioned officers and musicians, while a scarlet welt was added for officers. Finally, in 1904, the simple scarlet stripe seen today was adopted, with the varying widths prescribed for different ranks. ↑ "Reseña Histórica" (in Spanish). Spanish Navy. http://www.armada.mde.es/ArmadaPortal/page/Portal/armadaEspannola/conocenos_organizacion/03_Fuerza--03_Fuerza_infanteria_Marina--02_historia_FIM_es. Retrieved 3 January 2010. ↑ Kelly, Jack (April 12, 2009). "Kill the pirates". Pittsburgh Post-Gazette. http://www.post-gazette.com/pg/09102/962110-373.stm. Retrieved 2009-04-14. "Marine Corps Uniform Regulations". United States Marine Corps. 31 March 2003. http://www.marines.mil/news/publications/Pages/MCO%20P1020.34G%20W%20CH%201-4.aspx. Retrieved 2008-09-05. "Marine Corps Uniforms". Marine For Life. 3 September 2006. http://www.hqmc.net/index.php?option=com_content&task=view&id=47&Itemid=29. Retrieved 2009-10-11. Leicht, Cpl. Paul W. (March 5, 2004). 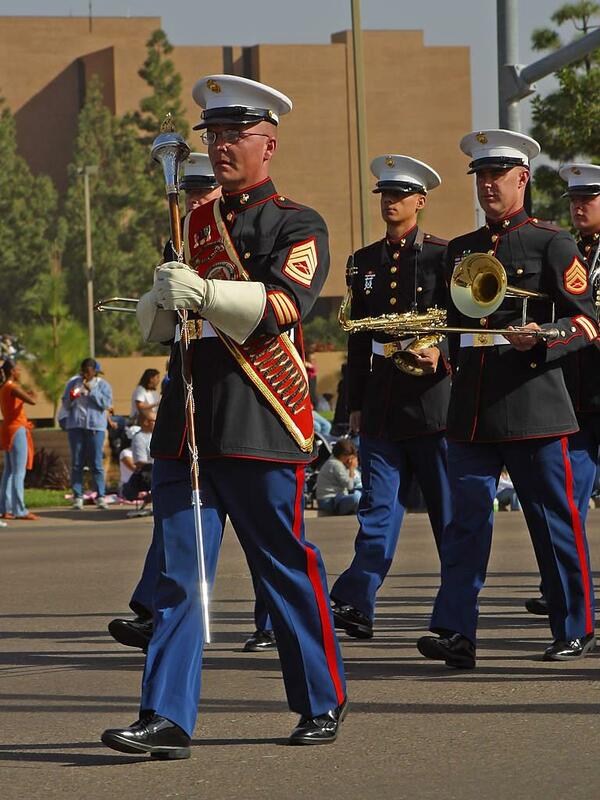 "Earning the Blood Stripe: Marines remember a legacy of sacrifice". Marine Corps Air Station Miramar: United States Marine Corps. http://www.marines.mil/unit/mcasmiramar/Pages/2004/Earning%20the%20Blood%20Stripe%20%20Marines%20remember%20a%20legacy%20of%20sacrifice.aspx. Retrieved 2009-10-11.